After all the hype and anticipation, the mystery of Galaxy’s next pivotal launch of Galaxy 4 is finally unraveled. Samsung’s IFA event at Berlin on Saturday, 3rd September, 2014 unveiled the Note 4 worldwide. The device was released with its sibling, Samsung Note 4 Edge. Note 4, though look a tad bit similar to its elder Note 3; however, its features are efficacious enough to give a tough competition to its rival HD LG G3. Note 4 will be available worldwide in October, 2014 in four mesmerizing colors. Note 4 is colossally brawnier and modish launch of the Korean tech-giant, much awaited by all as we head to the end of the year. Samsung’s Note 4 has upgraded and in fact, lifted the specs and features above the Galaxy S5 and the successor, Note 3. Note 4 has a modish and classy look with its plastic frame, resembling the faux leather (without stitch pattern). The back cover is more sturdier and metallic rim. 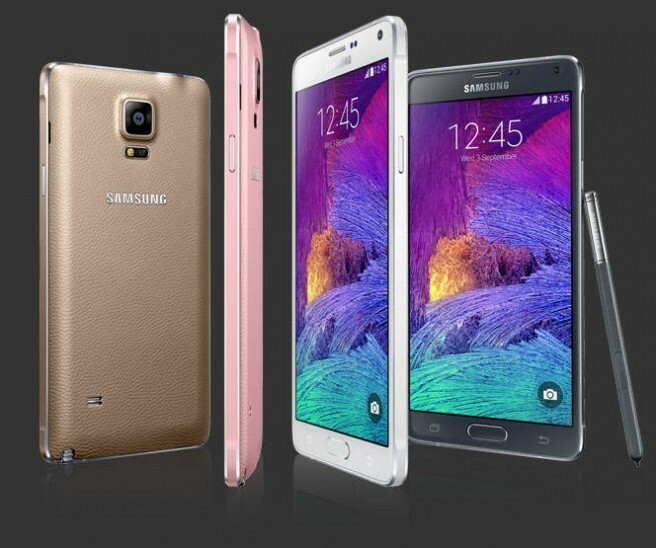 The four colors available in Galaxy Note 4 are Frosted white, Charcoal black, Bronze Gold, Blossom Pink with a lustrous mien. Moreover, unlike other phablets, Note 4 will neither be too huge to fit in your pocket nor too titchy to cause any hindrance in comfortable access. The 6-inch body is perfect for smooth and steady handling. Blissful news for the gamers out there, the powerful Qualcomm Snapdragon 805 processor will give you the unexcelled experience, even better than that of S5’s 801 chipset. The quad-core processor with the 3 GB RAM guarantee the fastest operations handled in seconds, thanks to Samsung developers. Although, the power-hungry processor and screen of the Galaxy Note 4, the 3220 mAh battery will not let your device lag or slouch. It was revealed that Note 4’s battery would charge to 50 percent of its whole in just half an hour. However, the S5’s feature of Power Saver that allows the phone to work for 24 hours with just 10% of remaining battery is not present in Note 4, as speculated. The Note 4 is embellished with a 16 MP primary camera, with the remarkable features such as Dual Shot, Simultaneous HD video and image recording, geo-tagging, touch focus, face and smile detection, image stabilization, panorama, HDR. The Touch Wiz ensures the ease of access to all the settings. For the selfie lovers, 3.7 MP front camera is beyond expectations and just hone the Note 4 experience. Is a skyrocket achievement for Samsung’s devices. Wonderful Note. I am waiting for getting my hands on Galaxy Note 4.